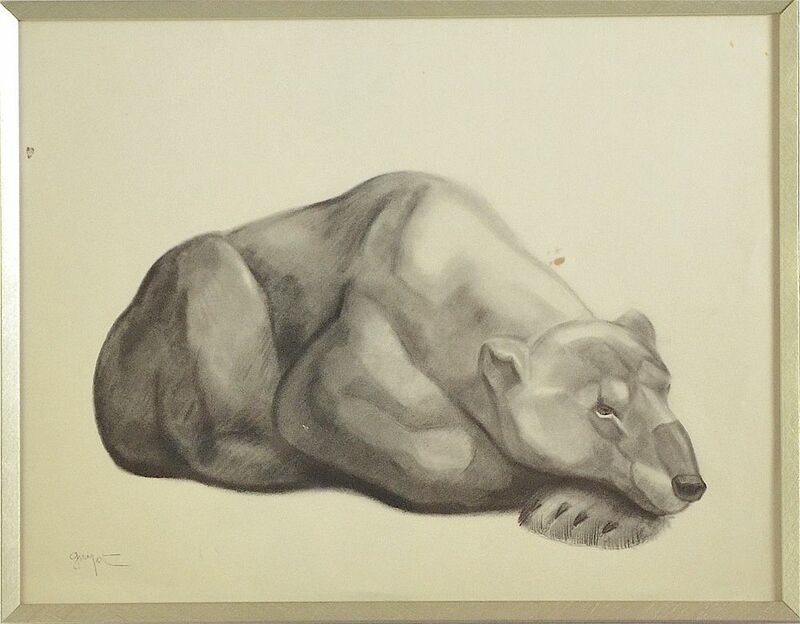 Another fabulous lithograph by the French artist George Lucine Guyot - this time a resting bear. It is signed "Guyot" in the bottom left. 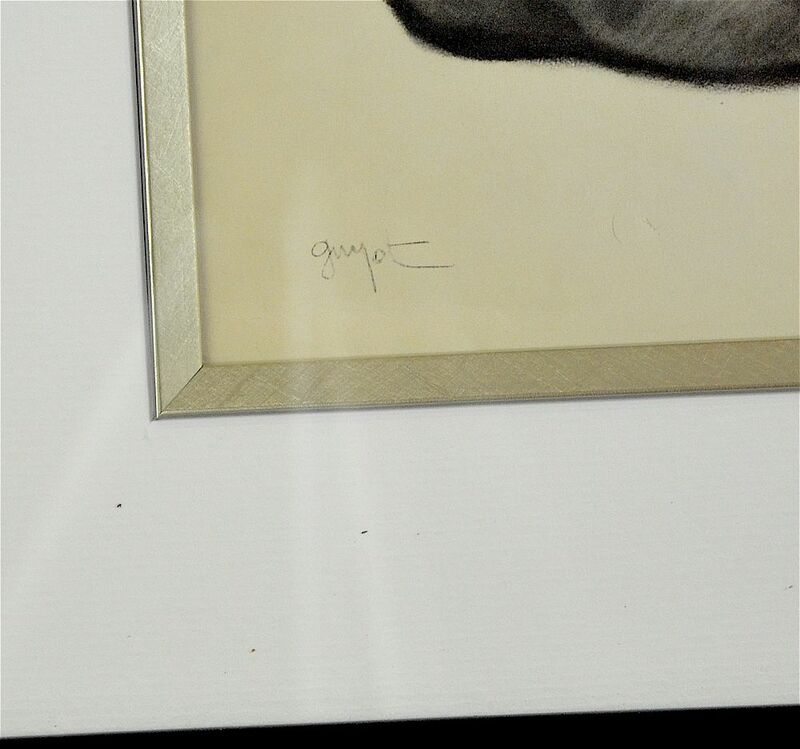 We have had it framed with a German gold slip, a cream mount and a black lacquer frame. 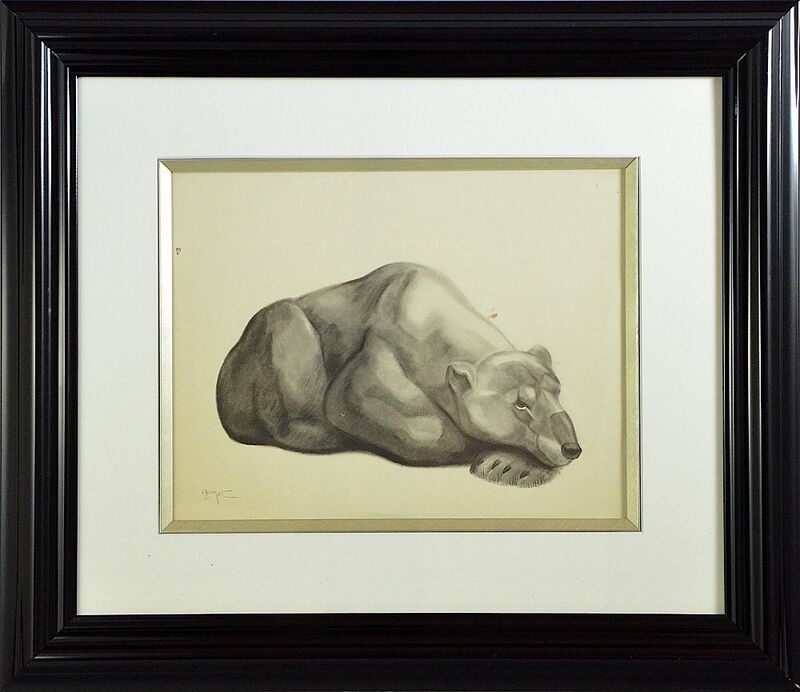 Although not numbered I believe that this is one of the lithographs that were produced by LeMatte et Boinot in 1937 in a limited edition of 200. French painter of animals, landscapes, pastel drawer, engraver, sculptor and illustrator. Guyot began work at 13 as a sculptor on wood for a furniture maker attending night school at the School of Fine Art in Rouen, Normandy. In 1918, he moved to Paris, settling in Picasso's Atelier at 'Bateau-Lavoir', after Picasso left Montmarte. He worked and spent his life in this atelier until 'Bateau-Lavoir' burnt in 1970. He exhibited paintings and sculptures at the Salon des Artistes Français, Salon des Indépendants, Salon d'Automne, Salon des Tuileries, Salon des Peintres Témoins de leur Temps. He was fascinated by wild life and animals and spent many hours studying them before translating them into sculptures, paintings, engravings, illustrations, wild animals, monkeys and bears. One of his sculptures of a bear is exhibited at the Vincennes zoo. In 1931, he joined with François Pompon, Charles Artus and Paul Jouve, to form 'The Group of Twelwe' which was active until the Second World War. He created also animal for the National Manufacture of Sèvres & for Haviland in Limoges. He painted landscapes of places in Rouen, views of Paris & its environs & of Montmartre where he lived. He illustrated 'De Goupil à Margot' by Louis Pergaud and 'Le Livre des Bêtes' by André Demaison.